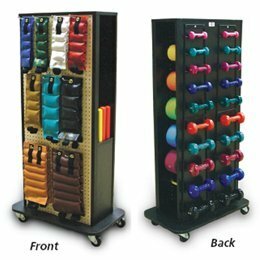 Coated almond color pegboard in front of rack has 11 pegboard safety hooks to hold 16 optional cuff weights. On the reverse side of rack are 20 dumbbell hooks to hold 20 optional dumbbells. Built-in dispensers for five exercise bands and one spare dispenser. Built-in compartment for weight bars. Storage space in compartment for up to 10 bars. Rack is 30"W x 18"D x 59-1/2"W. Weight capacity 250 lbs. Durable black laminate finish. Base plate has bumper T-molding. Cart is equipped with four 2" diameter swiveling, easy-rolling casters. All weights, dumbbells, bands and bars must be ordered as accessories.